Interested in building a website, but not sure where to start? Well let me tell you, HubSpot is the answer! The reason we’re huge advocates for HubSpot, and have created numerous websites using HubSpot’s Content Management System (CMS), is because it delivers the most personalized web experience available. Plus, some of the best websites on the web today were generated through HubSpot software! What exactly do we consider to be the best websites around? Check out this page full of inspirations and you will see what we are talking about! Not to brag, but you’ll even see a handful of websites designed by New Breed. Each site built on the CMS is responsive across all devices, allowing your customers to have a consistent and smooth experience from email to social to web. Being the first system that integrates websites, blogs and landing pages, it truly is the complete inbound marketing platform. One of the many aspects we love about the CMS is the ability to personalize our pages to meet the needs of each individual who visits our website. Using SMART content, forms and calls-to-action, we can select what we want specific users to see in our content and make their experience as individualized as possible. Unsure of what SMART content is? It’s a personalization tool that allows you to change certain elements of your website based on cookies, relevant to each visitor. A first-time visitor may need a clear introduction to your business and focus of expertise, while a lead could be supplied with more in-depth information about your services. Similarly, a current customer might be looking for some premium content offers specific to their goals. SMART content will help you create endless variations of content that you can use to make each visitor feel special and unique. With the ability of SMART content, you can ensure that your visitors won’t be subjected to viewing the same old content, forms and CTAs each time they visit your site. Your website clearly demonstrates who your company is, what your company does, and what the visitor can do on your site. You don’t want your visitor to be confused when they are on your site; instead, you want them to know they are in the right place. Your website resonates with your buyer personas. It should focus on their wants and needs and speak to them in an appropriate language. There is no need to fluff up your content; you want to be concise and let them know who you are instantly. Your value-proposition is appealing and easy to distinguish. Your visitor should know what your company clearly values and be able to find it quickly. Again, keep your buyer personas in mind when you are establishing your value-proposition so that they will want to stick around and see more of your website. 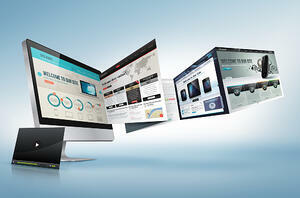 An easy-to-navigate website will score much higher than a website that is hard to cruise through. Eliminate any flashy objects that could get in the way of browsing like flash banners or pop-up ads. Remember to optimize your website for mobile devices since they are so essential in day-to-day tasks. The best websites use calls-to-action to direct visitors to the next logical step. CTAs help your visitors dive a little deeper into your website and move them further down the inbound funnel, assisting them to become a more qualified lead. Keep evolving your site! It doesn’t need to always be static. You may think about switching up the content when your visitors needs or problems change. Try doing some A/B testing to determine what content, CTAs and images perform best for your website and your audience. In order for your website to be great, it needs to have an awesome overall design. Confirm that your site layout, placement of CTAs, whitespace, colors, fonts, and other elements are used effectively.